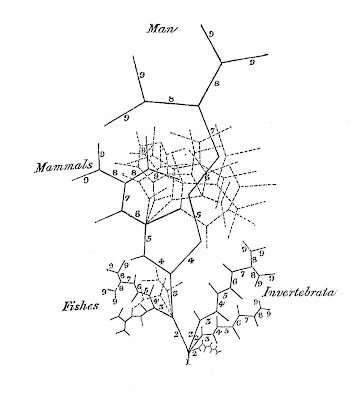 According to the received history, tree diagrams were either entirely new with Darwin or go back to Aristotle, depending on how you define things. BloDevelopmental tree as envisioned by the Scottish physician Martin Barry (1837, 346), an attempt to illustrate von Baer's theory of embryology. Although von Baer was critical of the excesses of Naturphilosophie, Barry manages to give a firmly progressionist message, with Man prominently ensconced at the top. We do not know whether Darwin saw this picture before he drew his own tree diagrams (see Chapter 4), but clearly such ideas were in the air. There is no suggestion that Barry, unlike Darwin, was promoting evolution. It's not as early as John's reference (which had a description of a tree but no diagram) but interesting nonetheless. Bob Richards and Ruse think this is influential, but I am not so sure. I think Darwin was more influenced by taxonomy and von Baer's ideas directly rather than through Barry. I don't know enough to have an informed opinion but I was doubtful of Ruse's claim just from the whelter of claims of "influences" on Darwin. Start with a box of salt seems to me a good rule of thumb.